The Sand Sole (Psettichthys melanostictus) can be distinguished from other flat fish in the Pacific Northest by the first few dorsal spines above it's 'left eye' which protrude beyond the fin webbing. 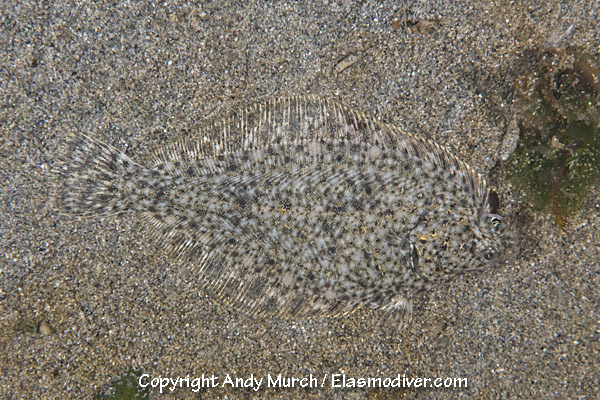 These sand sole pictures are available for commercial licensing. For further information regarding usage please e-mail Elasmodiver. All of the images on elasmodiver.com are copy right protected. No unauthorized use of these Sand Sole pictures is permitted. Please contact Elasmodiver for further information.